Quickthree Solutions Inc. – Transport. Deploy. Detach. Quickthree Solutions invents, designs and manufactures leading portable vertical storage solutions for wellsite operations. We are one of the first entrants into this space, and leverage our wealth of expertise to solve some of the industry’s greatest challenges. Check out our products to see our innovative and practical approach at work. Quickthree Solutions invents, designs and manufactures portable vertical storage solutions for wellsite operations. 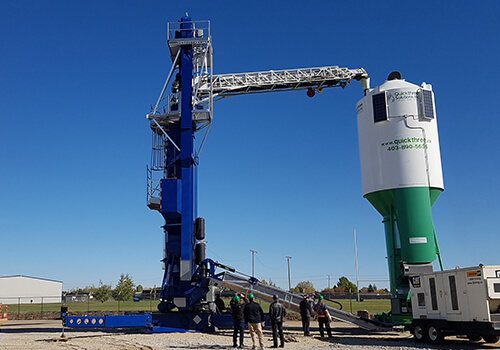 We began with the Quickstand Silo system, a product that is revolutionizing downhole proppant delivery and we've been innovating a complete solution to solve our customers challenges. Quickthree Solutions invents, designs and manufactures top performing bulk plants and portable vertical storage solutions. 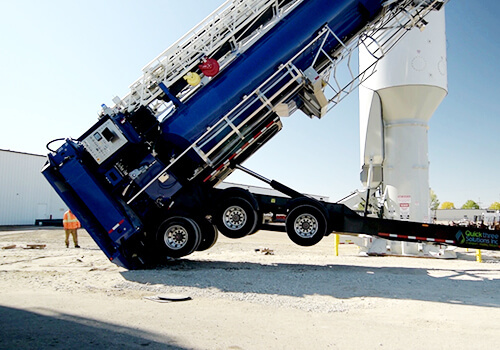 Engineered for smooth product fluidizing, clean out and optional solar powered scales, Quickthree designed cement systems can achieve unload rates up to 2.5 tons per minute. With our core Quickstand Trailer, the new Quickload 300 efficiently transports in one load and deploys in less than 30 minutes. When time is money, that’s a great way to lower the total cost of ownership. 5 tonne/5.5 ton per minute proppant transloading capability in a mobile system with vacuum dust collection? 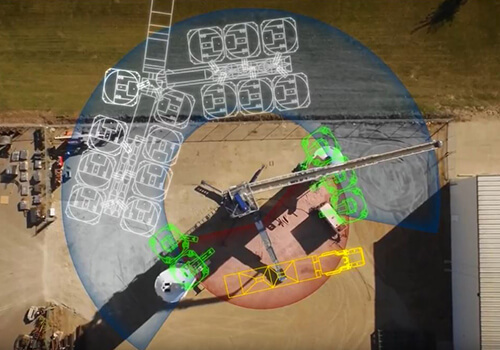 The ability to transport over 9 million lbs of on site proppant and replenish from additional onsite storage without moving? We’d say that’s an industry first! Designed to work with vertical and horizontal storage solutions, the Quickload 300 continues our tradition of the most compact site footprints. Go from a finished job to our Quickstand Trailer to getting on the road in an astonishing 20 minutes. Without a pilot vehicle. How’s that for mobile? Quickthree Solutions. Built on Three Core Values. From design to production, Quickthree commits to our customer that in everything we do we will always focus on the three core values of our business. Great products require investment. Quickthree’s model was created to provide a significant ROI and a quick payback. From operational costs to capital costs, the return is worth the investment. Our focus on environmental responsibility began long before it became a buzz phrase. Smaller footprints, integral filtration and quieter solutions not only make for a better work environment, they make for a better world. At Quickthree Solutions, we work hard to ensure your people are safe when working with our products. That’s why we design and build our products with automation where it makes sense, provide stability and safe processes: to keep your people protected. 330 tons/300 tonnes per hour is now a reality with the Quickload 300 Proppant Delivery System.